When I was 10 years old, my 11 year old brother and I were fishing from the wharf in our hometown of Hobart. It was 1976 and the only people around was a few local drunks and the beat copper trying to find a nice warm spot to stand for a minute or 2. These days Elizabeth Pier in is dotted with bars, fine dining restaurants and up market accommodation. But back then it was just Scott and I trying to catch a fish. We were cold, wet and hungry (we were always hungry). It was after 9 pm. We weren’t leaving until we caught one last fish. Suddenly, Scott felt a massive tug on his line. We had no idea what it could be. A fish was our best guess. Beyond that we had no clue. Us Sinclairs weren’t that smart. What we eventually dragged up (from the Derwent River in the middle of Hobart) after a 10 minute struggle was a hell of a surprise to us. We bagged our prize and raced home. When I say “raced” I mean we got home as fast as the old MTT bus would trundle us up the hill. “Mum, Dad…..you won’t believe what we just caught!” we gasped as we raced in the front door. They were AMAZED AND ASTOUNDED! You see, they’d never heard of anyone catching a shark before in the middle of Hobart. The point of this story is this: People love and read stories. It’s how we communicate most effectively. I reckon people are sick of the same old boring sales copy – could your business just start telling stories of amazing service, great care or personal anecdotes to connect with your market? It was only a little shark to be sure. 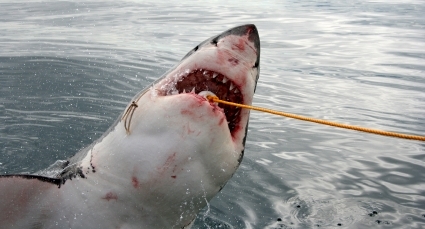 But it was big enough to let me tell people we once caught a shark in the middle of Hobart!